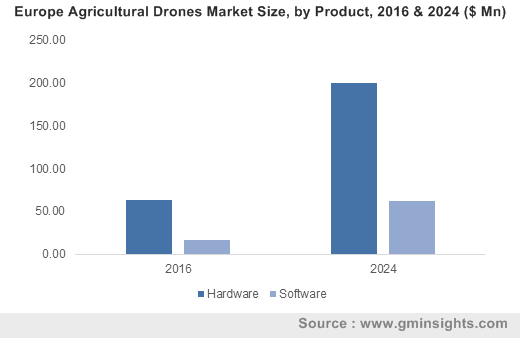 Agricultural Drones Market size was over USD 300 million in 2016. Global shipments are set to grow at over 13% CAGR from 2017 to 2024. UAVs incorporated with multispectral, hyperspectral, infrared, or thermal cameras provide a better vision for farmers in agricultural space for protecting their crops and plantation. The images provide necessary data helping in monitoring and decision making for the farmers. The navigation system provides the exact location to be identified for repeated monitoring. Software solutions deliver real-time data for the farmers helping in reducing crop inputs, increasing profits, and boosting yields. Intuitive reports developed from software for specially designed farming applications will aid in improving farming knowledge. 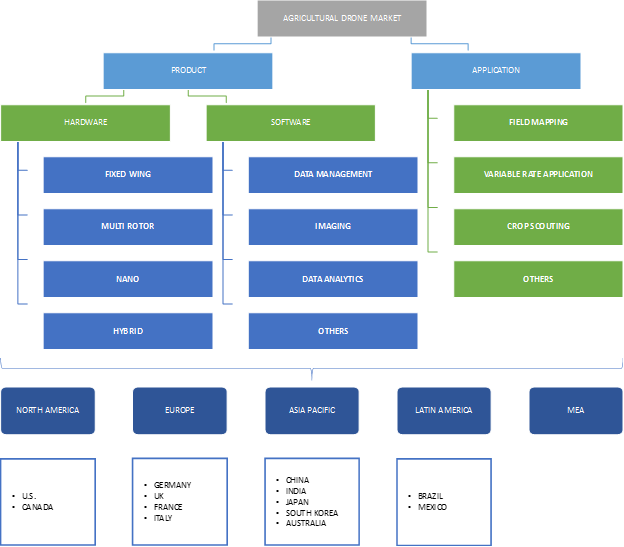 Field mapping applications dominated the global agricultural drones market size. Benefits such as increasing yield benefits by analysing and monitoring the crops are expected to support the segment growth over the forecast timeline. Crop scouting is expected to witness significant growth owing to its accuracy of fertilizer spraying. Development of graphical indicators such as Normalized Difference Vegetation Index (NDVI) helps in differentiating bare soil from grass or forest and detects plants under stresses by using various infra-red sensors. New federal rules are expected to encourage more innovations in the agriculture industry and make the technology affordable for average farmers, thus offsetting industry restraints. In June 2016, the Department of Transportation’s Federal Aviation Administration finalized operational rules for the routine commercial operation of small (weighing less than 55 pounds) drones, called as unmanned aircraft systems. The rules eliminate the requirement of pilot’s license for operation thereby simplifying the buying for commercial purposes. The FAA states that small UAVs should be flown below 400 feet, and it allows the farmers to operate beyond the line of sight. Public safety concerns and the lack of trained pilots are the major factors restraining the industry growth as the UAVs require safe operation to avoid accidents or emergency situations in farms. Stringent government regulations will hamper the wide adoption of the agricultural drones market. Maintaining UAVs as a legal entity and securing privacy rights and air safety is a major concern for this industry. Countries such as Nepal, Kenya, and India have bans or strict restrictions on UAV usage. The Association for Unmanned Vehicle Systems International (AUVSI) works with policy makers and the public to make use of UAV technology legal for civilian use. AeroVironment, DJI, DroneDeploy, GoPro, PrecisionHawk, and Trimble Navigation are some of the major companies operating in the agricultural drones market. The companies are focusing on having strategic acquisition in order to gain competitive market share in the industry. Corporate investors such as Monsanto, Syngenta, and Mitsui, backed emerging start-ups for improving harvesting, crop spraying, and irrigation. In February 2016, US reported investments in UAVs and robotics with volumes up to USD 389 million in 2015 and approximately 40 companies raising the funds. DJI, a well-established player in China raised USD 75 million during its first drone launched especially for the agricultural space. Patents, government regulations, and giant firms taking advantage of economies of scale pose high entry barriers for new entrants. The existing firms will face high competition whether the operational business is in photography or inspection for different purposes, further lowering the agricultural drone market price trend. Agricultural drones provide in-depth monitoring and analysis of crop health by providing live data from a range of sensors which include multispectral, LiDAR, and NIR. This live data enables agronomists and farmers to map the health of crops and helps in observing the transformation of crop periodically. These products help in cutting down labor forces required for monitoring and inspection. They provide the farmers with different views of the crops to differentiate between healthy and unhealthy crops. They can fly in any weather conditions due to their water resistance benefits. Generally, agricultural drones fly at a height of 50-100 meters. However, for flying above 50 meters, special authorization is necessary. They are expected to have a wide scope in future owing to the enormous range of applications thus improvising precision agriculture.